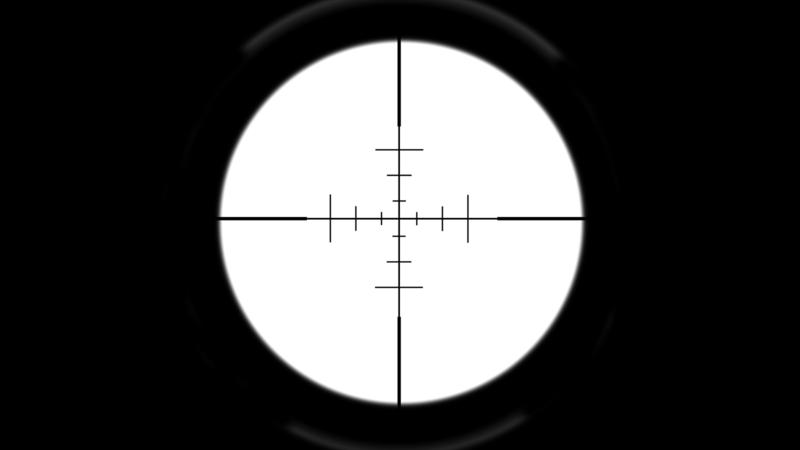 Just simple texture drawn on-screen with alpha. This way is mostly used in games that are lacking GPU performance because it’s the most fastest way for GPU. Scope glass have different material which is rendering to texture part of the screen and displaying it on glass. Camera is moving near glass when zooming. 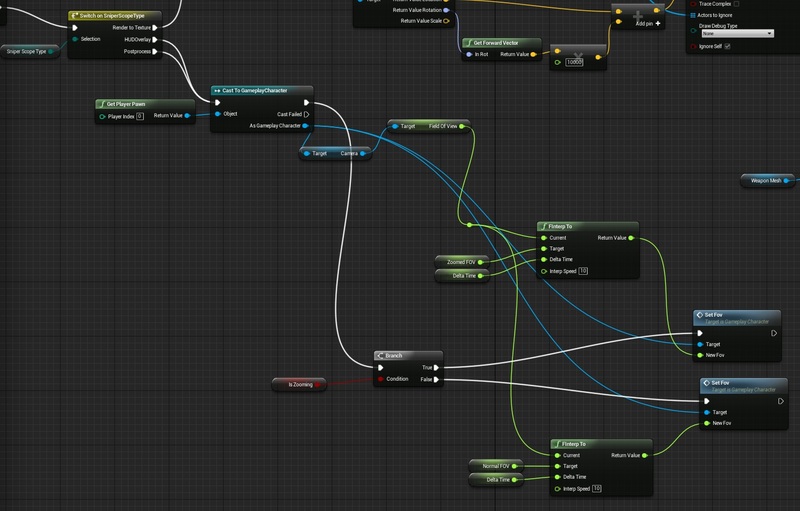 You can a lot of features here because it’s rendered in world so you have whole shaders to drive effects. You need to render to texture in tick so it’s heavy for mobile, but you could use it without a problem on PC. It’s heavier than HUD overlay. Basically it’s “almost the same” as HUD overlay but you can use shaders here – you can make distortion, draw texture, point out enemies and lot’s of stuff. It’s hard to say how heavy it is compared to render to texture. It depends on engine and how it’s driving post process. This way doesn’t even work on mobile. For my opinion you will get the best results using this way. I will implement them all to show you how to do it. 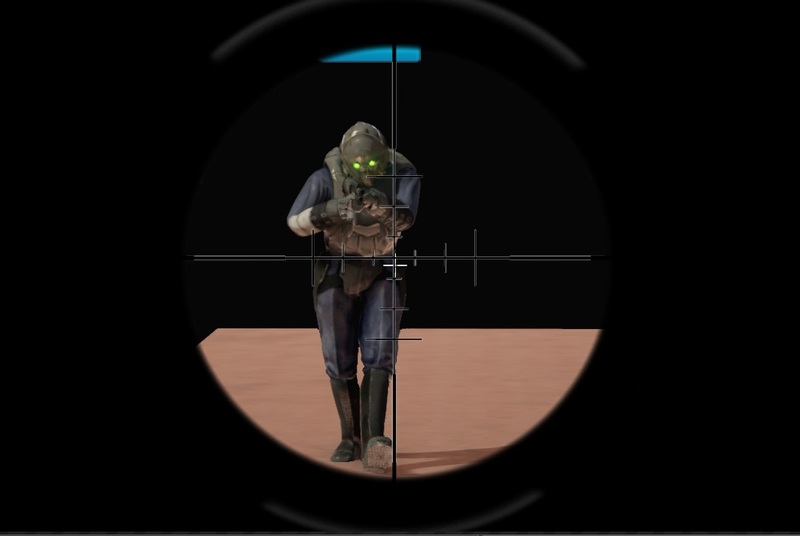 Basically using sniper scope is custom functionality that will be used only for Sniper weapons. We will trigger it using Right Mouse Button. Maybe later I will use Secondary fire for this. Create Right Mouse Button event and connect those dispatchers. This functionality is generic and it will be used differently on each weapon. That’s why I have created dispatchers – weapons willing to use them will just bind to them. And in Fire function let’s assign spawned projectile to this variable. Yes, sniper will use projectiles instead of instant fire. 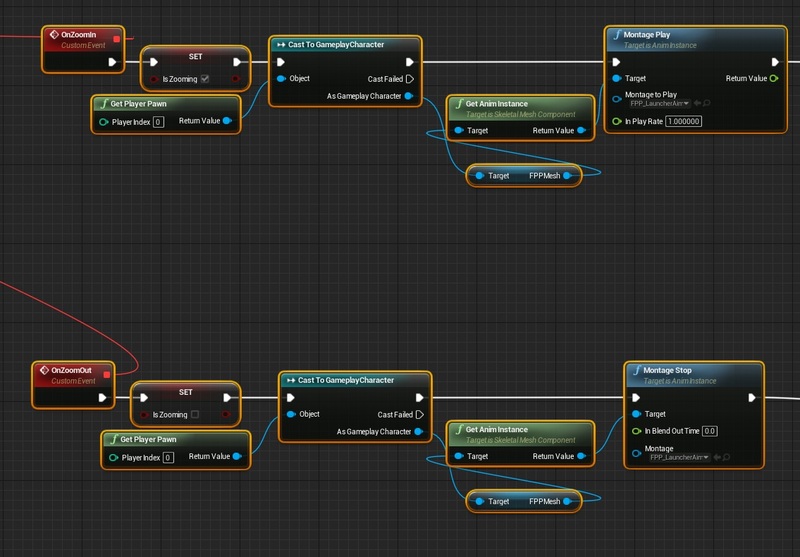 Create new blueprint extending from BP_BaseProjectile named BP_Projectile_SniperWeapon. Now create new camera component here and attach it to CollisionSphere. This will be our camera for bullet time. Place it somewhere near bullet. 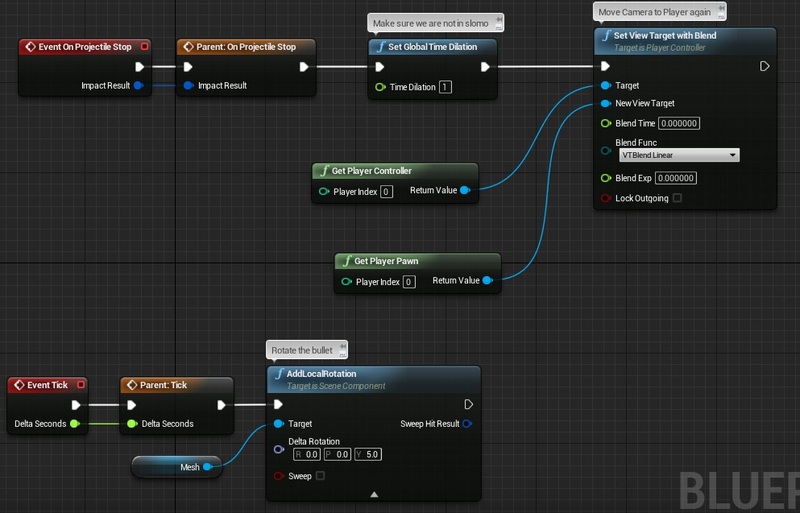 Now in event graph rotate the bullet and on projectile stop set view target to player. 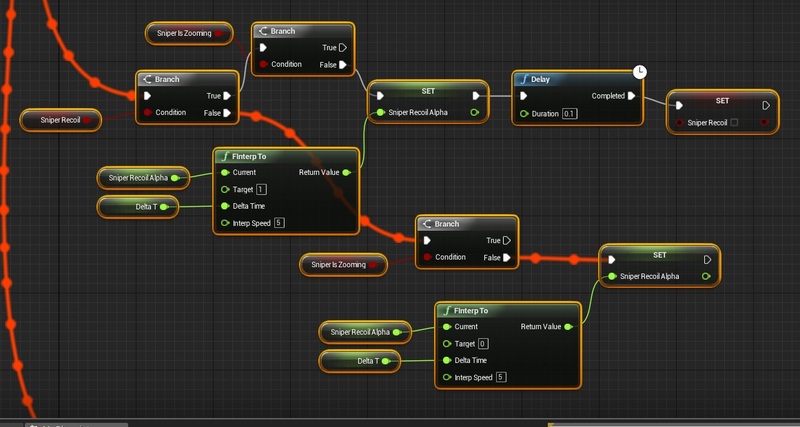 Overall – Creating Sniper Rifle blueprint. Open WeaponType enum and add SnipeRifle to it. Create new blueprint based on BP_MainWeapon named BP_Weapon_SniperRifle. Basically if you read previous tutorials you should be able to add new weapon without a problem! Now in ShooterGameInstance add this weapon to the list so you will be able to equip it. Overall – Sniper Rifle and hands. 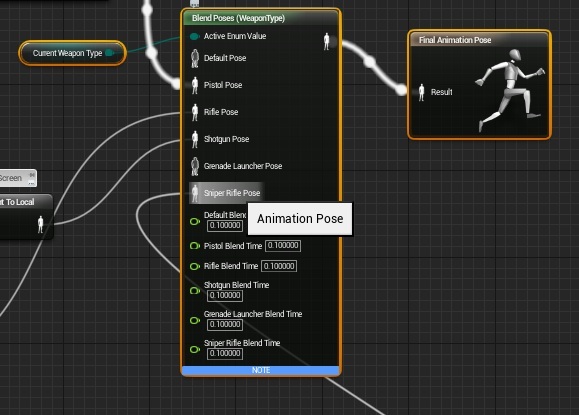 Create animation montage from this pose and set slot to Normal. 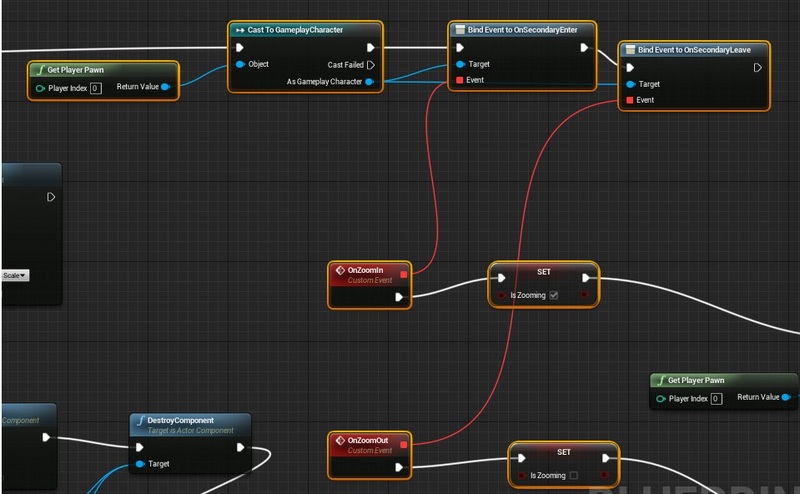 Now in Event Graph -> Initialize Animation there is CharacterFire custom event attached to OnCharacterFireWeapon dispatcher. We need to add Sniper Rifle recoil there. Now in update animation we need to check when we are doing zoom from SniperWeapon. The last one is the most time-consuming one because you need to test it in-game if sniper is near player eye. Here’s my graph maybe will be helpful. Make sure to connect the result to SnipeRifle in Enum! You won’t be able to test it out because we are not driving IsZooming bool in SniperWeapon. 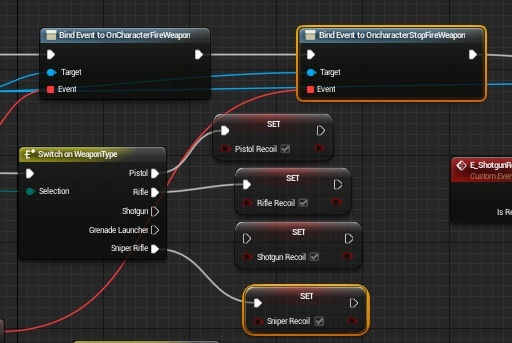 Open BP_Weapon_SniperRifle and in begin play connect dispatchers created in GameplayCharacter. If you place your weapon near camera you will see clipping. To fix that go to Project Settings -> General Settings -> Near Clip Plane set to 1. You would need to restart the editor to see the effect! We have our base in place now let’s move to creating overlay! This is the most hard type to implement so I will do it as first. There’s great basics tutorial here. 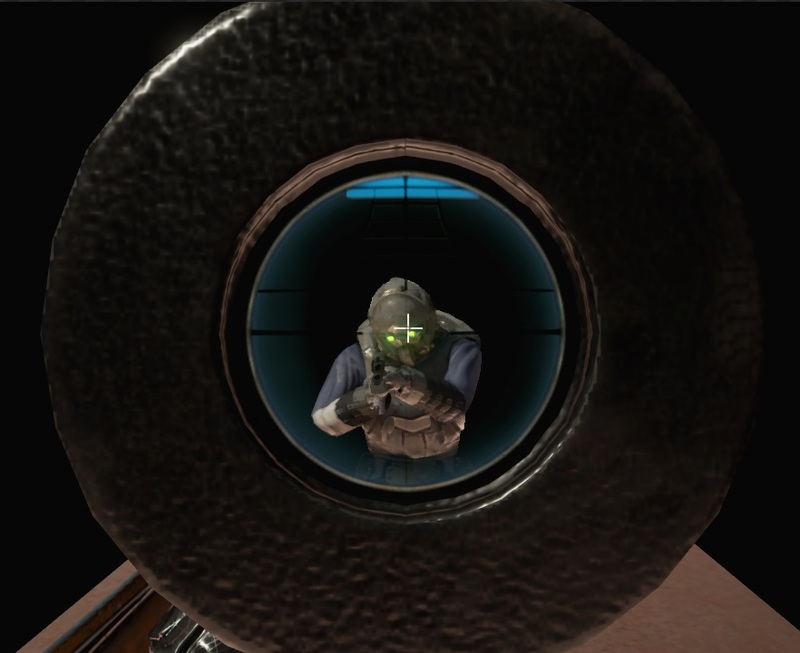 Download the M98b_scope.tga texture. (you can’t use it in commercial work!) You will need to have some 3d knowledge to be able to use this method. There is one big problem with sniper rifle from military silver weapons pack. It have one material. Scope is in the same material as the rest. 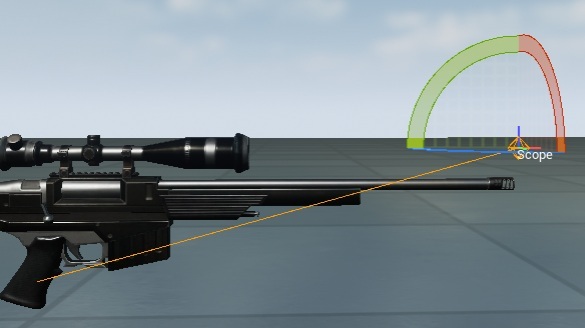 To be able to do it you would need to set different material for the scope glass only. 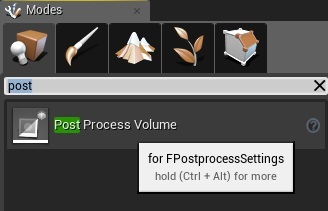 It can be done using blender/3ds/maya if you export the .fbx file and import it again. I’ve tried to find contact to military weapons pack creators and let them know to add one sniper rifle with different material on scope glass but I wasn’t able to find it out. Basically if you want to create games by yourself you need to learn basics of 3d graphics. Creating UV, modifying polygons, exporting data, working on bones. There is a lot of tutorials on the web! It will take a couple of weeks to learn the basics but it’s necessary if you are seriously thinking about making games. Create new 2d render target. My resolution is 512×512. The bigger resolution the worst performance. 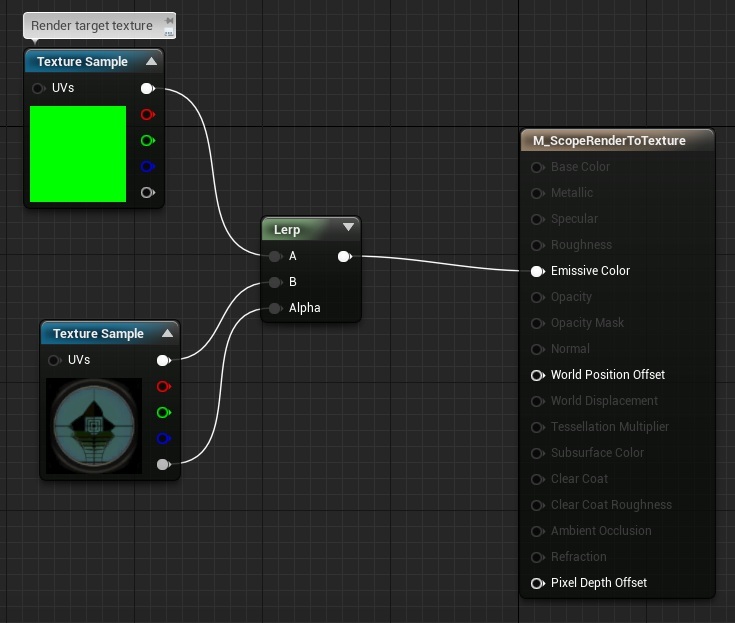 And create new material which will use render target texture combined with M98b texture. Assign this material to your scope glass. It will be used to position Capture Component. Now in your Sniper Weapon blueprint. Add the scope in place where the original scope was. 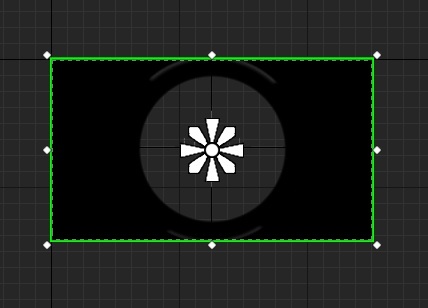 Create new component – Scene Capture Component 2d. Add another component – camera and place it so it will see a weapon from left side. In the begin play attach capture component to Scope socket. Now in OnSecondaryEnter / OnSecondaryLeave dispatchers let’s play zoom pose which we created earlier. Now in Tick we need to rotate the Scene Capture Component 2d to be sure it’s pointing where player is looking at. Without this you will have different view when watching level from render texture. Now we need to shoot the weapon so create Fire event. If you want to have |bullet time effect” (don’t know how to name it) just add this in your Fire event. In Tick we know if we are pointing the head, and here we can just change the camera with blend time and scale the time dilation. That’s all here. Your scope using render to texture should fully work now! This will be MUCH more easier to create. 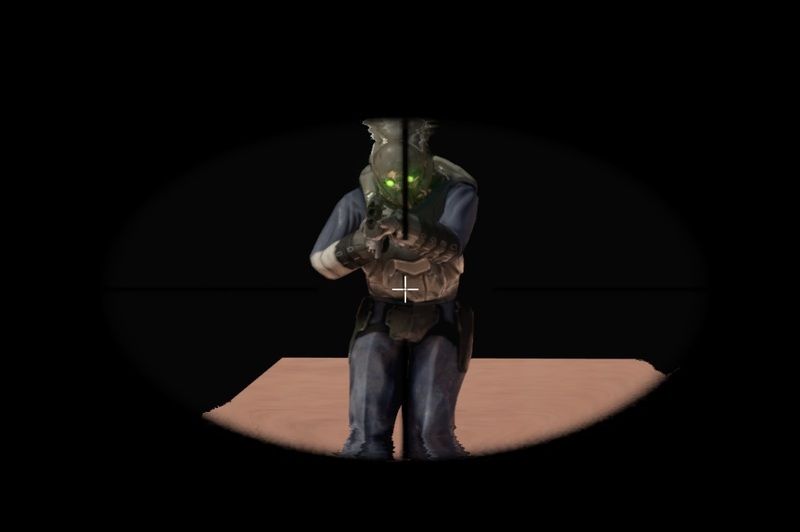 I’ve searched whole internet for some good free sniper scope texture and I haven’t found any. I have found this but you can’t use it in commercial projects! If I will find free scope or something with commercial license to buy I will let you know! If you are graphics artist and you are able to create such scope – please create one and add to Turbosquid for couple of bucks and let me know! Good think is that you can create this by yourself using Gimp. Found great tutorial on youtube. Import the scope texture into content browser. Create new Widget -> UI_Debug_SniperScope and add the image into it. Make sure whole screen is filled. Now get back to BP_Weapon_SniperRifle. 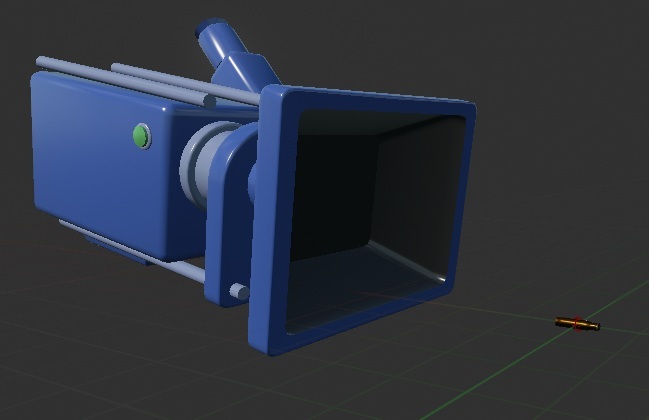 In begin play I’m making sure scope and render to texture are hidden. I’m attaching new weapon mesh (from military pack silver). Now OnZoomIn event make sure you add widget on-screen. And on OnZoomOut remove it from the screen. Last thing is to drive fov in tick. Before you start please read this documentation from UDN and download sample images. Again you can’t use them in commercial work! 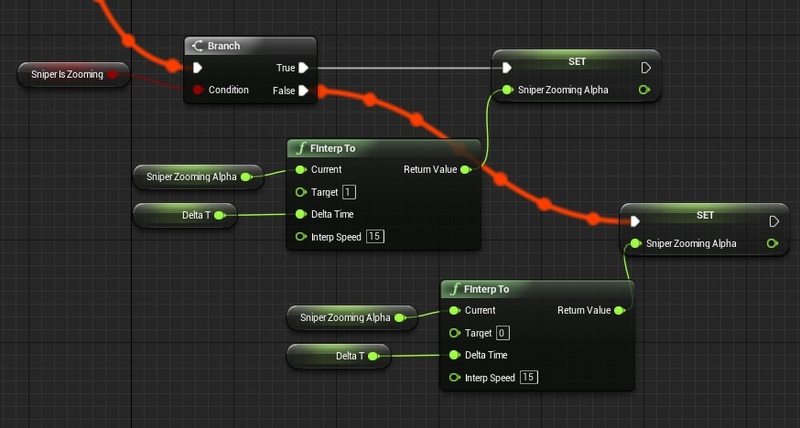 Those are the missing functions in Weapon Sniper OnZoomIn and OnZoomOut. You should call them now there. Import the textures and create new material. Make sure your material is PostProcess. Now in your level place Post Process Volume. It means it will work even if you are outside the volume. Now go to Level Blueprint graph and create begin play. We need to assign this volume to our reference in GameplayCharacter. It was post for more advanced blueprinters 😉 As always take your time do experiments, add print text nodes. Don’t copy all! Have you read earlier tutorials? Are you using the same engine version as mine? (info at top of the tutorial) – it’s using custom interface to do the damage. I solved it. No I am using UE4.9. the solution is that you forgot or I forgot to define the ammo type in begin play. the other issue is that the when I am zooming the sniper and shooting aiming head, enemy dies but the slow mothing that you added is still there until i shoot couple of times again. what the problem? Hey Farrukh, sorry I’m late but I’m just finally getting to this tutorial – you would just need to make sure your timeline is at a max length of .65 seconds and that it definitely resets to a value of “1” at the end. Sounds like you have left it at the default of 5, possibly. 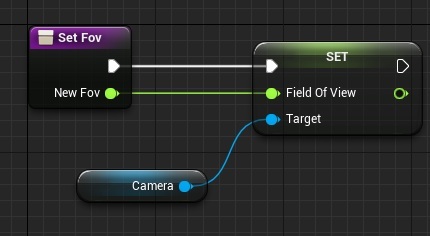 Another quick note – in the bullet time section of the Sniper Rifle BP you would need to connect the “Set Max Speed” node to ‘Play From Start’ in the TImeline node, instead of “Play” as pictured. That will ensure the slow mo resets. Not sure if that was an error or maybe that was fine/would work in older versions of the engine, but it doesn’t work in 4.10.